Sale Type: Auction-Consignment	-- Sold! 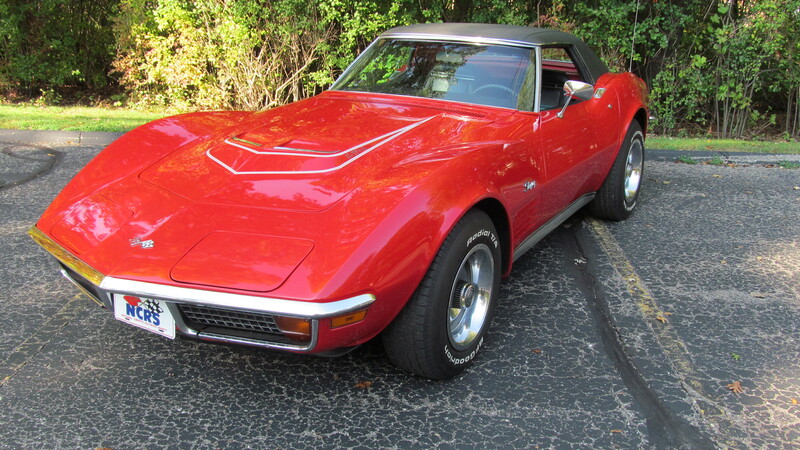 This 1972 Corvette LT1 A/C convertible is powered by its original, matching-numbers LT1 350ci engine mated to a 4-speed manual transmission and is equipped with factory air conditioning. This car was originally delivered to Herb Hallman Chevrolet in Reno, NV. It has its intact A.I.R. System and is highly optioned from the factory with power steering, power brakes, power windows, deluxe black leather interior, hardtop with a black vinyl soft-top, tilt and telescopic steering, AM/FM radio and RWL tires. Finished in Mille Miglia Red, this vehicle is in good overall condition with a rust-free frame and bird cage. It has received one repaint.